In the three and a half years of itвЂ™s existence, the participants of the Ecological Cooperation Project have carried out more than 200 activities towards conserving and protecting the environment. Among them, inventory control and certification of natural monuments, compiling ecological cards for villages and city districts, clearing of illegal waste tips, gardening activities, re-introduction of rare plant species, recovery of parks, mapping and protection of springs, feeding birds, participation in the publications of literature and films about the protection of the environment, and distribution of pamphlets for ecological enlightenment of people everywhere. Students in Kazan have cleared the beaches of the Kazanka river, cleaning up garbage and waste. During the "We'll Conserve the EarthвЂ™s Beauty" project at the Silicate lakes, near Lipetsk, the waste around a lake and in a forested area nearby was cleaned up. The pupils of a secondary school in Borodino village (Ivanovo region) conducted clearing of the beaches of "Pishchalino", as well, its dam was strengthened. The children from "Schools of the young explorers of nature " (Kamchatka region, Palana settlement) are monitoring territory near the school and a bordering park. The members of ecological club from Gymnasium #1529, in Moscow, had a summer expedition to Solovetsky museum in 1999. Members were engaged in clearing the territory of an island, removing waste and placing of demonstrative signs for the tourists. The schoolchildren from Syktyvkar, cleaned a forested urban area of waste and removed fallen trees in a wooded zone in the camp "Bely Bor". The members of the school ecological society "Yuneco" (Maloyas village, Bashkortostan) did research for "Household waste: Methods of Reuse". All authorized and unauthorized waste-tips are inspected. There are lectures with the pupils ( 5-11 classes), and a letter on liquidation of waste-tips was addressed to the management of the region. 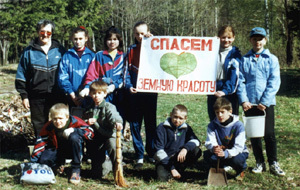 In April, 1999 they conducted an ecological month campaign, in which the pupils of 5-11 classes ( 600 schoolchildren have participated.) Under the initiative of "Yuneco", the schoolchildren from Maloyas Gymnasium were involved in the cleaning of waste from a school court yard, their streets and yards and park. One more ecological raid was organized on October 8, 1999. Young naturalists from the public ecological organization "Harmony" (Thermalny village, Kamchatka) permanently participate in the actions on clearing of a stone-birch forest, springs and territory the village from household waste. 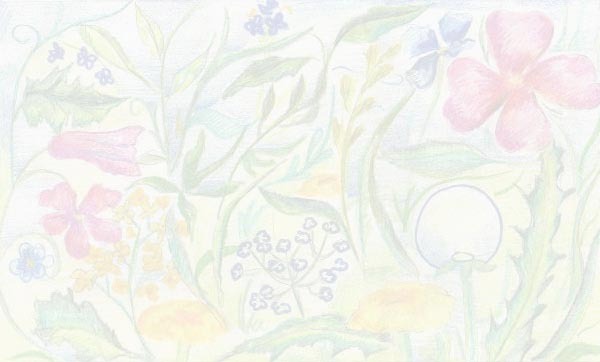 In St.-Petersburg City Palace of Youthful Creative Work, polling lists are prepared with the purpose of obtaining of information on the threats to spring plants of the Leningrad regions. 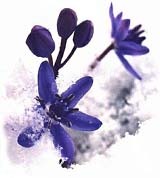 In winter of 1999 children from Ulyanovsk Regional Station of Young Naturalists have conducted a program of a winter bouquet instead of fir-tree at Christmas and New Year. Under the initiative of the employees of Republican Children's Ecological and Biological Center, and Small Wood Academy of Petrozavodsk, young foresters have planted 120 trees in territory of Children's republican hospital, as part of the project "The Green shield of Petrozavodsk"
In frameworks of a "March of parks" children of Lipetsk Station of Young Naturalists "Ecologist" on April 24-26, 1999 have conducted an ecological activity in the вЂњ 30-Years of VictoryвЂќ Park. 70 school children participated in this activity. 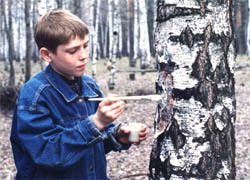 Another activity, "Green lungs of Lipetsk ", involved painting over wounds on 60 birch trees. The wounds were caused by people collecting the sap of the trees. Bird houses were also placed throughout the park. A study of a Kamenny Log were conducted to reveal ecological problems affecting this monument of nature. The schoolchildren have been planting trees as well; 85 willows in a 300 m stretch along the Lipovka-river. Also, eleven of the largest unauthorized waste tips are described, seven different leaflets are in widespread distribution, and photographs documenting the ecological disturbances have been made. The letter, with results of this inspection has been sent to Lipetsk Ecological Committee. Schoolchildren also have acted via radio and television. During a trip to Fashchevskoe Forestry, young naturalists helped 30 wounded birches, and scavenged in a forest looking for waste. The condition of 32 ant-hills detected in the previous years is tested, 4 new ant-hills are marked on a card. Children from the kindergarten #105 (the teacher is N.V.Gorlova) have found one wounded birch, which they were glad to help. Pupils from the society "Lukomorie" of Zelenograd school #1692 have planted trees on school territory are currently observing them. In "Voroninsky" Nature Reserve the operation "The Steppe saver" on preservation of rare plants of steppe is organized. The children work under the direction of the employees of Reserve and teachers to not only monitor the number of rare plant species, but also to grow them on a special site, and then re-introduce them to nature. Schoolchildren from a Maloyas Gymnasium (Bashkortostan) annually land 10-15 hectares of a fur-tree and pine. It is made by with 7-8 classes, more than 200 pupils. In September - November, 1999 the young ecologists also studied Maloyas springs and were engaged in their clearing. And by October 15-25, 1999 decade action "An ecology and health " was conducted. All schools - more than 1000 pupils, have taken part in this one. Young naturalists from Nekrasovskaya school, Yaroslavl region, observe an ancient park of Nikolo-Babaevski Monastery. Together with the workers of forestry they design measures for monitoring territory of a park. The children participated in cleaning waste, have placed 10 starling-houses, and have planted more than 100 birches on the coast of the Volga. The lectures on a history of a park, class hours and excursions for the children are carried out with the purpose to educate in them careful relation to nature and to conserve this rare monument of nature and history for the future generations. The pupils of Novomoskovsk school - complex #12 and Palace of Youthful Creative Work (Tula region) have conducted a large activity for natural conservation in a Children's Park вЂ“ a unique natural and cultural object of a town. A park called "green lungs" of this industrial center. Here, one of the largest European rivers originates. On the basis of integrated research, the schoolchildren have suggested a number of recommendations on improvement of the ecological situation in the park. Within the framework of this program, they carry out regular inspections on cleaning waste in the territory of the park, and a nursery garden has been organized. Due to the publications in press and the appearance on radio and television, children's organizations of Novomoskovsk have managed to attract attention of the townspeople in ecological problems of a Children's Park.